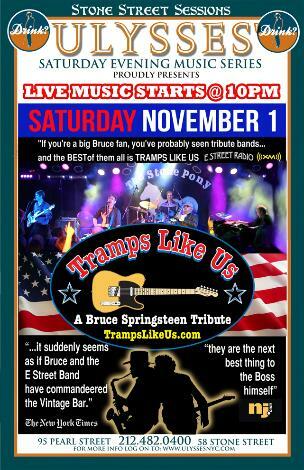 "TRAMPS LIKE US" - THE WORLD FOREMOST BRUCE SPRINGSTEIN TRIBUTE BAND"
Tramps Like Us brings 2 decades of road tested musicianship that have won this band hard earned distinction of the planets most revered BRUCE SPRINGSTEIN TRIBUTE BAND. Given high praise by dozens of publiciations, radio stations, music industry personnel and "THE SPRINGSTEIN CAMP" themselves. Rockers and ballads are delivered with raw intensity and swagger reminiscent of the BOSS himself. Formed in 1990, and featuring a line up of seasoned and professional musicians with a repetoire of 120 songs, TRAMPS LIKE US has been dedicated to enjoying and sharing BRUCE's music in a LIVE setting.